Many NWSL players were traded this week between Chicago, Utah, and Houston. When Chicago hosts Utah this weekend we may learn who came out better in the trade. The Chicago Red Stars will host Utah Royals FC in week 13 for their second meeting of this season. The first time they met was for the first ever home game for the Royals in front of a sell out crowd. Red Stars’ midfielder Danielle Colaprico spoiled the homecoming for Utah fans in the 27th minute when she rocketed one past Abby Smith from outside the box. However, the Royals are fresh off a 1-0 win over the previously undefeated North Carolina Courage thanks to a late goal from Brittany Ratcliffe. Chicago and Utah are only separated by one point in the standings with Utah sitting in fourth with 17 points and Chicago sitting in sixth with 16 points. 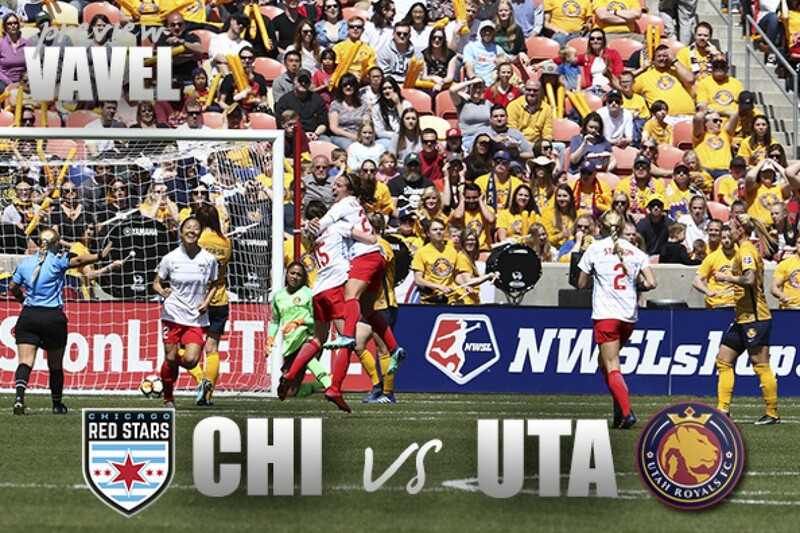 The Red Stars and Royals meet this weekend at Toyota Park in Bridgeview, Illinois. Kickoff is set for 8 pm ET and can be watched on go90 or on NWSL for viewers outside the US. It has been an exciting week in the NWSL and no games have been played yet. This weekend Utah Royals FC will face the Chicago Red Stars after a big trade between the two sides and the Houston Dash. On Monday it was announced that the Red Star’s traded Sofia Huerta and Taylor Comeau to the Houston Dash and Samantha Johnson to Utah. The Dash sent Christen Press’s rights to Utah. While Utah sent Brooke Elby and draft picks to Chicago. Full details can be found here. Chicago also welcomed Morgan Brian back to the NWSL. Brian has spent 2018 in France with Olympique Lyonnais. Another win for Chicago this week is that during last week’s match against the Portland Thorns two Red Stars saw their first minutes of the season. Casey Short and Vanessa DiBernardo saw 25 and 11 minutes, respectively, after being out with injuries thus far into the season. Laura Harvey announced that even though Press and Johnson are available they will not play this weekend per gentleman’s agreement with Red Stars’ coach Rory Dames as reported by Sean Walker. Utah does not have any goal scorers with more than two goals this season. Ratcliffe, Diana Matheson both have two goals, while five other players have one goal each. Press could be the missing striker for the Royals. Press has 44 goals in 100 caps with the USWNT. Press also has 35 goals in 60 games in the NWSL. Johnson will also be able to contribute to this defense that has only allowed in eight goals this season. Once, Kelley O’Hara is healthy Utah’s backline could be a solid Rebecca Moros, Becky Sauerbrunn, Johnson, and O’Hara. Chicago has lost some big contributors to their impressive squad in Huerta, Comeau, and Johnson. However they may not feel the absence as much as one might expect, a potential starting eleven was put on Twitter by Chris Henderson @chris_awk. The back line consisted of Arin Gilliland, Short, Katie Naughton, and Elby, then Brian, Julie Ertz, and Dibernardo in the midfield, Colaprico and Yuki Nagasato on the wings with Sam Kerr sitting up top. That is a team that is more than capable of winning tons of games both by scoring goals and stopping them.